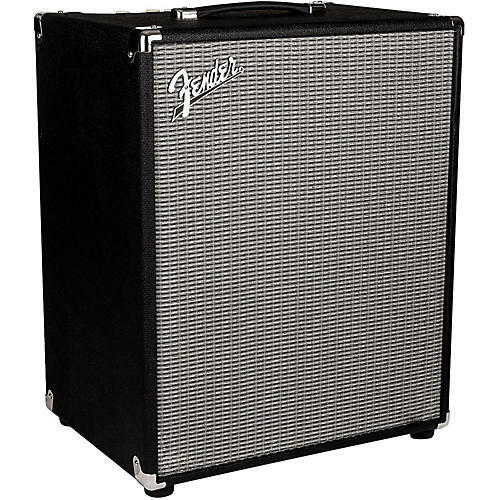 The new 500W Rumble bass 2x10" combo delivers huge, booming low end without losing clarity. Along with the twin 10" Eminence-designed speakers, it houses useful features and easy-to-use controls, including 500/350W power levels, aux. input, headphone output, Vintage tone switch, Contour on/off, Bright on/off and an FX loop. Re-engineered from the ground up, Rumble amps are lighter and louder than ever, with even more power and a classic Fender vibe. A newly developed foot-switchable overdrive circuit and versatile three-button voicing palette deliver powerful tones ideal for any gig. Dimensions: 23" x 19" x 14"